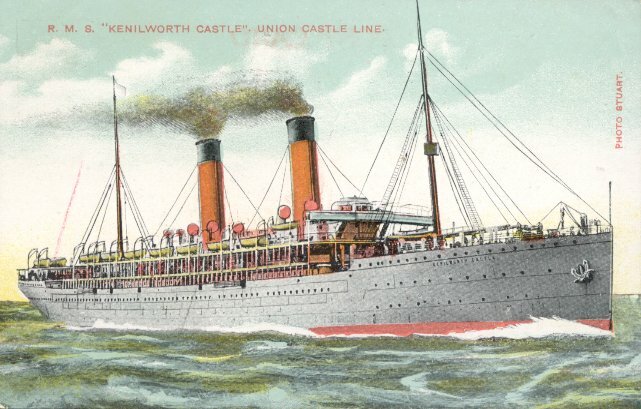 Kenilworth Castle and her sister Armandale Castle were the first mail steamers ordered by the newly-merged Union-Castle. 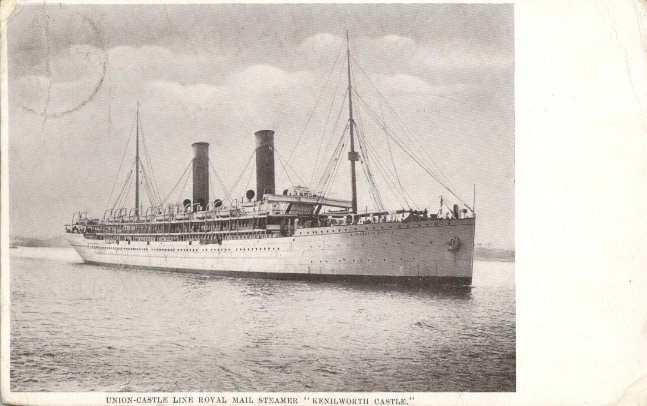 Kenilworth Castle, the younger of the two, was launched at Harland & Wolff, Belfast, in December 1903. She was delivered to Union-Castle in May 1904, and was placed on the line's mail service between Southampton and Cape Town. The ship was used as a troop transport during World War I, surviving a June 1918 collision with H.M.S. Rival off Eddystone. In that collision, live depth charges released from Rival exploded under Kenilworth Castle's stern. 15 crew members were drowned and the ship was badly damaged. She returned to commercial service at war's end and was broken up in 1936. Sources: Haws' Merchant Fleets; Kludas' Great Passenger Ships of the World; Mallett's The Union-Castle Line; Dunn's The Ships of the Union-Castle Line.